The monastery was founded in 1912 by exiled French monks who had moved to Belgium before relocating to Canada. The 50 to 60 men who now reside in the monastery live by the motto “pray and work.” And since 1943, part of the work at Saint-Benoît-du-Lac has been making cheese. It is the only cheese factory managed by Benedictine monks in North America. The monks started their cheese making with a blue called Ermite, but today Mr. Pruneau and 11 other full-time employees produce nine cheeses ranging from pressed ricotta to aged Gruyère-style wheels. Their other famous blue, Bleu Bénédictin, made since 2000, is an award-winner across Canada, most recently winning the blue-cheese category in the 2006 Canadian Cheese Grand Prix. 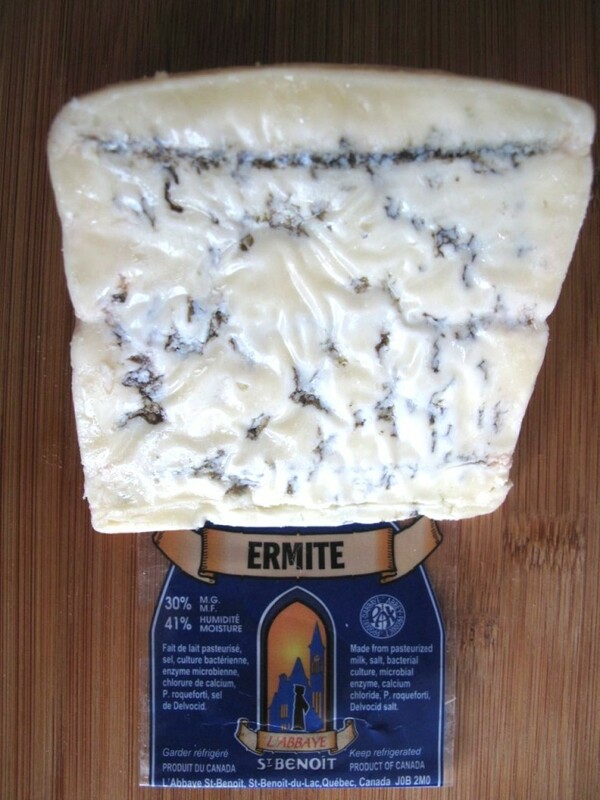 Ermite, the milder of the two, is aged for five weeks, then removed from the ripening room and the natural mould rind that has formed is washed away. Both blues have a cream-coloured paste veined with a blue-green mould, but can easily be distinguished by the different-coloured foil in which they are wrapped: silver for the Ermite and gold for the Benedictine. When you slice into them, the Ermite has more crumble compared to the more velvety texture of the Bénédictin. Both cheeses are well balanced in flavour and have a nice salty linger, with a mushroomy essence. The Ermite has a grittiness to its paste and is tangier on the finish, while Bénédictin is more powerful, well-rounded and fuller.